Indian mobile super-disruptor Reliance Jio continues to out-pace its rivals in terms of customer acquisition to become the fourth-largest domestic MNO. 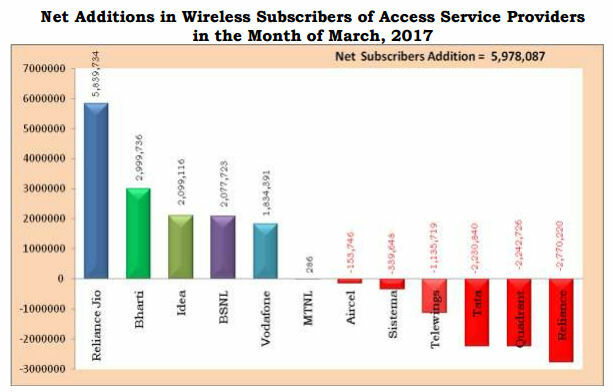 The six million subscribers added in March, according to the Indian telecoms regulator TRAI, actually represent a slow-down for rampant Jio. On the back of the time-honoured customer acquisition tactic of offering stuff for free, Jio sprinted to 100 million subscribers from a standing start in just 170 days – an average gain of around 17 million per month. Having said that it still outstrips all competitors by a considerable margin, with Bharti Airtel managing half that and then Idea, BSNL and Vodafone the only other operators to manage any growth at all. 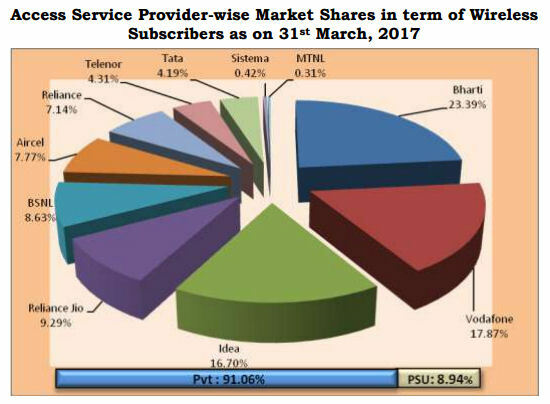 Since the overall market only grew by six million in March, quite a few others experienced significant subscriber losses in the months, headed by Reliance, which is merging with Aircel amid the rush to consolidate. Jio took the fourth spot from the largest state-owned player BSNL (Bharat Sanchar Nigam Limited), while even when their merger is complete Reliance/Aircell is in danger of falling behind Jio if current trends continue. Jio’s rate of customer acquisition is likely to keep slowing but it’s currently hard to bet against it continue to out-pace the chasing pack.